The Boundary Commission has published proposals to reshape parliamentary constituencies across the country. 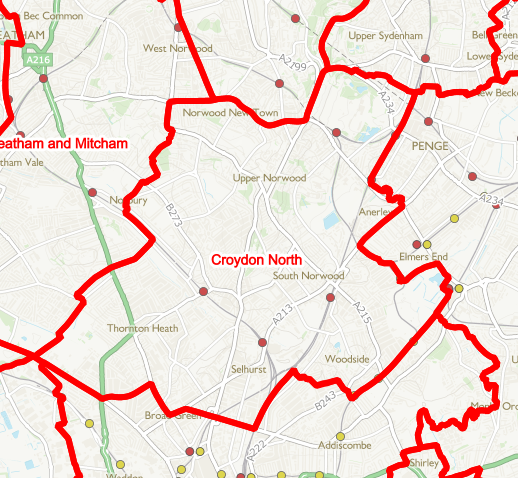 Croydon North will be affected and I’m keen to hear what local people think of the proposals. There will be a further public consultation before final proposals are agreed. The reason the Government has given for making changes is to reduce the number of MPs by 50 to save money and to make constituencies more equal in size. As ever with the Tories, what they say and what they do are very different. The Government have appointed over 250 new unelected members of the House of Lords, costing over £34m – far more than anything saved by reducing the number of elected MPs by 50. Clearly saving money is not their real purpose, nor is fairness since the vast majority of these new Lords are Tories. While equalising the size of constituencies sounds fair, that’s not what the Tories are doing. They have excluded 2 million registered voters from their calculations, and refused to take into account people who have not registered to vote yet but who live in the constituency and use public services like schools and hospitals. Because wealthier areas have fewer of these people, the Tories have effectively discounted millions of poorer people from their calculations. The result of all this is that constituencies will not be equal in size and the Tories will get more MPs without winning a single extra vote. The proposals leave most of Croydon North alone, but they suggest moving Norbury into a new Streatham and Mitcham constituency, while Broad Green (the area around West Croydon station) would move into Croydon Central. To make up the numbers lost, Croydon North would gain Crystal Palace ward in Bromley, and Woodside (south of Norwood Junction) would move from Croydon Central into Croydon North. I am keen to hear what residents in these areas think of the proposals for their neighbourhoods. The whole rationale behind changing constituency boundaries is unfair. Millions of registered voters are excluded and millions more residents not counted at all. There’s multi-million pound increase in costs because the Tories have appointed many more new Lords than the reduction in the number of MPs. And the proposals reshape many marginal constituencies to make them easier for the Tories to win. Despite all this, it is important that residents make their views known. These are only proposals at this stage and can be changed. You can leave your comments on the Boundary Commission’s website.